Where do you get your Bitcoins? Is it some random website you just typed in Google search? Buying cryptocurrency online is like buying meat from your favorite Meat Shop. You know that you are able to buy the cuts that you need for the price in which you are comfortable paying. Another thing to put in mind is that you know what you are getting from your favorite meat shop. You get the best steaks, ribs, and specially blended sausages and not some mystery meat that came out of the freezer. Trust, is a keyword when it comes to looking for the best exchange website. That search has led as today to one of the most talked about exchange websites today, Coinmama.com. What does this website have in store for us? Do they carve out the best deals? Or are they one of those websites that seems to provide everything that you need, but at the end of the day they just want to rob you of your hard-earned money. We will look into this together. Coinmama.com is a property of NBV International s.r.o., Boženy Němcovej 8, Bratislava 811 04, Slovakia, which is a daughter company of New Bit Ventures Ltd company #514907880. New Bit Ventures Ltd is a regulated entity registered as a Money Service Business # 31000084489239 (this information can be seen in Coinmama’s FAQ’s section). How does one create an account with this website? The first step that we need to take is to head on to their website www.coinmama.com and click on “Register” which can be found on the upper right corner of the homepage. To create an account, you need to provide your email address, a password for the account, your complete name (first, middle, last) and your country of residence. Once you have provided everything that is required to create an account, head on to your registered email and confirm your account. 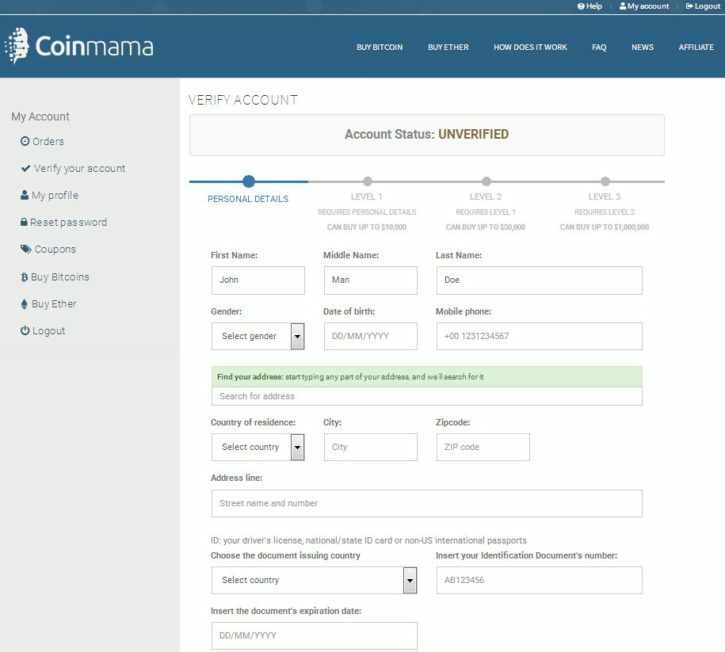 Once an account is created and you have successfully logged into your new Coinmama account, you will be logged in and see a similar picture to what I am showing above. This shows your account page and everything that you need to know in regards to purchasing coins from them. The landing page should show you all of your orders. Now that we know how to create an account, the next process would be to know how to buy coins from them. You have two options, buy Bitcoins or Ethereum. For example purposes, we will be talking about how to purchase Bitcoin as the process is just the same for the two. 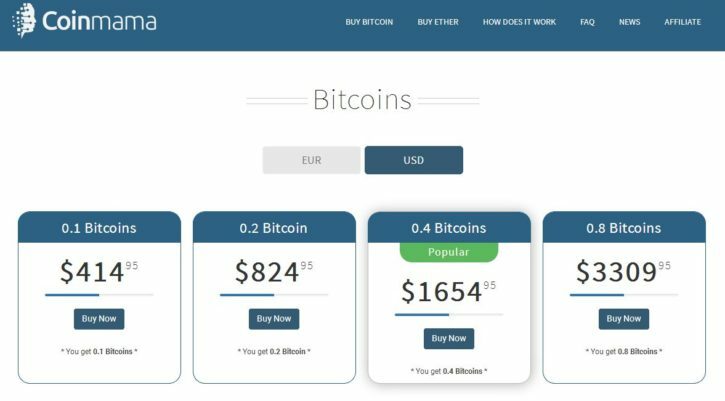 Click on “Buy Bitcoins” for you to be redirected to the purchasing page wherein you are able to choose how much Bitcoins you need. On the purchasing page which is shown in the screenshot above, you are able to choose how much Bitcoin you want to buy. There are pre-made packages wherein you just need to click on and get that amount of Bitcoin, or you can manually slide the bar which is located below and enter a specific amount needed or depending on the budget you have on hand. What about fees? Compared to any other exchange website out there today, Coinmama charges up to 6.3% in payment fees on top of their Bitcoin rate. You are able to read more about their rates and fees here. Here at Coinmama.com, they have what is called “limits” to what you are able to purchase depending on the account verification level you are at. What are the levels and the respected limits? An unverified account is a raw account that you get right after you registered with them. In order to transact and start purchasing Bitcoins or Ethereum, you first need to verify your account. A verified account is achieved by providing sensitive information to the exchange website. Information needed is your complete address, country of residence, city of residence, and documents to prove your identity. In general, the more information you provide about your identity, the more you can buy from them. On the verification page, they say that the level 3 account holders can purchase up to 1 Million US Dollars worth of Bitcoin. Their FAQ says that there is no limit for a level 3 account when it comes to buying crypto. Anyhow, if you are currently at level 2 and you feel that your account is not just enough for you then you need to contact support@coinmama.com and request for an upgrade. Please be advised that submitting ID’s means that you need to upload clear pictures of your ID showing the front and back of it. Customer service comes in line with what customers say about a company. If a company or website has unacceptable customer service this would easily reflect on what people say about them. A good website should and always have a great customer service which should be on par with what they have to offer. When it comes to websites that transact with money i.e. exchange websites, then customer service should be top notch. What type of customer service does Coinmama.com have? You are able to contact Coinmama’s Customer Care number through +1-800-261-6932 and contact them through their business email at business@coinmama.com. If you need help for account related issues, you can also send them through support@coinmama.com. What are the people saying about them? There are a few talks regarding some users having to receive their ordered coins late from the expected time. I scanned through most of the so-called “scam claims” and most of these are just misunderstanding or system related issues that resulted in the delay of the customers being able to receive their purchased coins. One particular issue that was shared by two different Reddit claims can be read here. 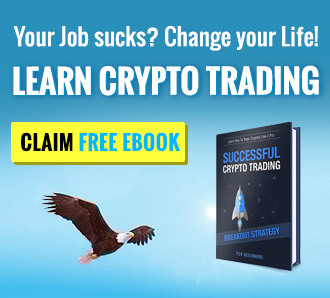 As mentioned in the first part of this review, looking for the best exchange website is like looking for the best meat shop. Trust is always the key and in order to create that trust, we need to be sure of whom we are transacting with. 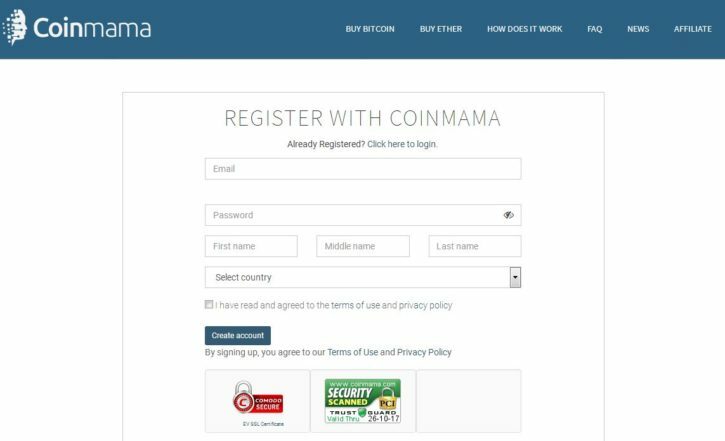 What we have found about Coinmama.com is that you are able to easily create an account with any email provided but the buying part is where it gets interesting. Without personal information being submitted through the internet, you are unable to buy any Bitcoin at all. Of course, they need this information for them to process credit card payments and for documentation processes. Are we 100% sure that they will be keeping our files protected? I’m unable to guarantee that but you should put that into consideration. Are we able to trust them? They have been catering to customers for years now and with minor scam allegations, yes, we might trust them. Do they have a great customer support line? They can be contacted through phone, which is always great if you ask me. All-in-all, this website isn’t so bad at all. Just keep in mind that in order to create a trust-worthy relationship, we first need to let go sometimes and let everything run its course. They Legit..but the robbing you a little bit every time….buy 500 get 490…..buy 100 get 95….but 200 get 190….although u already paying a up front fee…..n they say is rate change..ok cool maybe the first and second time…but I check d rates I have been monitoring them…the thiefting you a little bit every time….I switching from them from today.